3 Panel Split (Triptych) Metal Print Wall Art Baton Rouge Bridge Over Mississippi River in Louisiana at Night. Modern metal wall art for home or office wall decor & interior design. 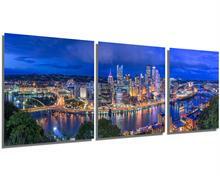 Printed on Luxurious, HD aluminum glossy metal panels. Multi panel art.